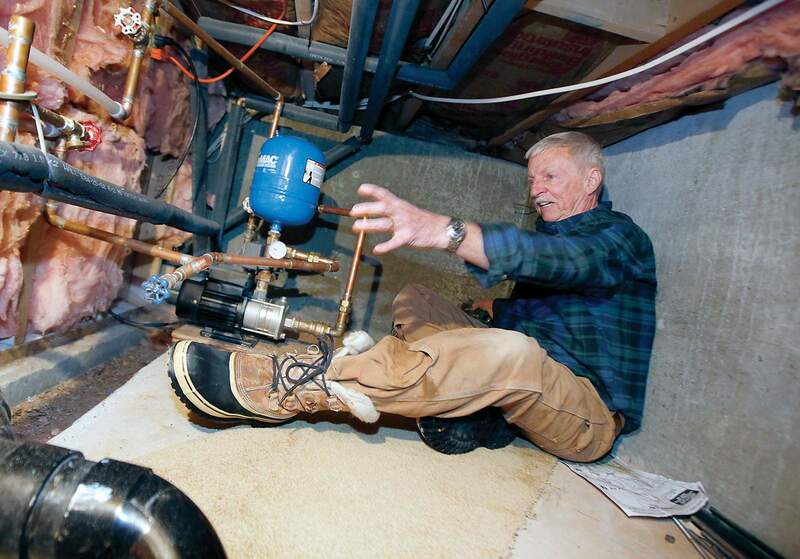 Ron Cornelius describes how he replaced a water pressure boost pump twice in the crawl space below his home on Timberline Drive. He says the city failed to notify him that it was turning off his water for lack of payment, which caused the pump to break. He is now suing the city in small claims court. Ron Cornelius came home thirsty late one night in 2016. He went to the faucet, turned the knob and put a cup under the spout. Nothing came out. “It turns out they had shut the water off, and they never left a notice that they were there,” Cornelius said of Durango’s water department. Now, about three years later, he’s suing the city in small claims court. Cornelius says improper billing and failure to notify him of service termination led to his water being shut off without proper notice, which destroyed two water pumps. Cornelius, who is representing himself, is asking for $1,650 from the city. City Attorney Dirk Nelson said the city does not owe Cornelius anything, arguing that the municipality is immune from the lawsuit because of the Colorado Governmental Immunity Act, which blocks people from suing the city for certain injuries suffered. The Colorado Governmental Immunity Act was enacted in 2016 in an effort to protect municipalities and taxpayers from what the statute calls “unlimited liability” that could degrade public services or functions. But sovereign immunity is waived in certain instances, including actions of injury resulting from the operation or maintenance of a public water facility. Cornelius says because the water department turned off his water without notice, he didn’t have the opportunity to prepare his pumps, and therefore, the city can be sued. But the city says the city’s finance department made the decision to turn off Cornelius’ water, not the water department, and therefore the city is immune from lawsuit under the Colorado Governmental Immunity Act. La Plata County Judge Dondi Osborne heard arguments from both sides last week. She expects to issue a ruling about whether the case can proceed on Feb. 4. The city of Durango first shut off Cornelius’ water in October 2013. He thought it was a joke, at first – a cruel Halloween prank of sorts, he said. Cornelius has a water pump in his home that needs liquid flowing through it to operate – if the machine dries up, it breaks. The new pump cost him $440, he testified. His water was shut off again in early 2016, causing his pump to break again. Finance Manager Amy Arnold, taking the witness stand, said the city sent Cornelius bills in December, January and February of 2013 and 2014, but they weren’t paid regularly on a monthly basis. “We’re seeing two bills before a payment is received,” she said. Arnold testified the city went 75 to 80 days without payment before Cornelius’ water was shut off on Feb. 27, 2014. Cornelius did not dispute that his payments were late; but he blamed it on the city’s billing practices. The city sends its water bills via the U.S. Postal Service, Arnold said. But mail delivery is spotty in Cornelius’ La Plata County neighborhood, northeast of city limits, he testified. City water bills are generated on the 20th of every month and are due by the 10th of the next month, Arnold said. Delinquency is triggered on about the 20th of each month if a bill isn’t paid, Arnold said. The city sends a delinquency notice, and if the bill isn’t paid by the first of the next month, utilities will be shut off. Water customers can receive electronic billing, Arnold testified, but Cornelius said he wasn’t aware of that until recently. Cornelius said he doesn’t always get his bill on time because he’s not home or because it shows up in his neighbors’ mailbox. When he does get a bill, it often has past-due charges because he often misses them, he said. It may take a letter five days to get to him, he said. Cornelius said he has been confused by how the city reports past-due amounts, he said. Cornelius testified he did not receive any notice when the city shut off his water, and no city employees contacted him. The city has his phone number, email address and physical address, but it never called, sent an email or stopped by, he said. Arnold said it is city policy to send those kinds of notices by mail. The city has about 7,200 water accounts, so there’s no way the city could notify everyone with a personalized message, she testified. The city says it did all that is required in notifying Cornelius that his water would be shut off. But Cornelius thinks the city hasn’t gone far enough.